CLARKSVILLE, Md. – The world’s most famous wheelchair racer lives in an unassuming house on a cul-de-sac, a half-hour’s drive outside Baltimore. A visitor could be forgiven for missing the street, Clarksville neighborhoods can look much alike, and for failing to understand that this is the home of an elite athlete, even after taking a look around. Want to see the six medals Tatyana McFadden won at the Rio Paralympics — four gold, two silver — in every individual wheelchair event from the 100 meters to the marathon? There’s no trophy case. Just off the front entrance are family photos of McFadden and her two sisters, captured in different phases of their lives. McFadden won four gold and two silver at the 2016 Paralympic Games. Hey, Tatyana, where are your medals? In a travel bag, it turns out. But if you want to hold one or even wear one around your neck, McFadden is happy to oblige. Meanwhile, among the clutter of a house that’s still being unpacked from her summer adventure, is the trophy she received from Team USA, naming her the best female Paralympic athlete in Rio. McFadden doesn’t seem to have completely absorbed the impact of all the honors, how they have made her something of a celebrity athlete and, increasingly, the face of the U.S. Paralympic movement — the ongoing effort to get disabled athletes the same kinds of opportunities and media coverage able-bodied athletes enjoy. During interviews in Rio de Janeiro during the games and a day-long session in Maryland a few weeks afterward, McFadden was just herself: focused; upbeat and down-to-earth. A small example: When McFadden ventured out to practice in her hometown one day this fall, it wasn’t a glamorous event. She methodically knocked down laps around a track tucked away behind Reservoir High School for hours at a time, listening to the likes of Rihanna and the Chainsmokers. McFadden practices at an outdoor track near her mother's home at Reservoir High School in Clarksville, MD. The high school girls soccer team practiced on the infield, either unaware or unfazed by the fact that the New York City Marathon record holder was literally racing circles around them. Maybe the kids were locked in on their own sport. Maybe they missed McFadden’s post-Rio appearance on “The Ellen DeGeneres Show.” Or maybe they were just used to her. While McFadden also has been featured on NBC, she still has a degree of anonymity, even if it might be shrinking — something Olympic stars might envy. Her attitude is to enjoy the accolades as they come along and keep on living her life in the meantime. Since her Paralympic debut in 2004, the 27-year-old McFadden’s fame has only grown greater. “Tatyana certainly has shown a brighter spotlight on the sport and it’s been just an incredible opportunity that she’s embraced, and has done such a fantastic job of promoting the sport and pushing it forward,” said McFadden’s coach, Adam Bleakney, who runs the Paralympic program at the University of Illinois. 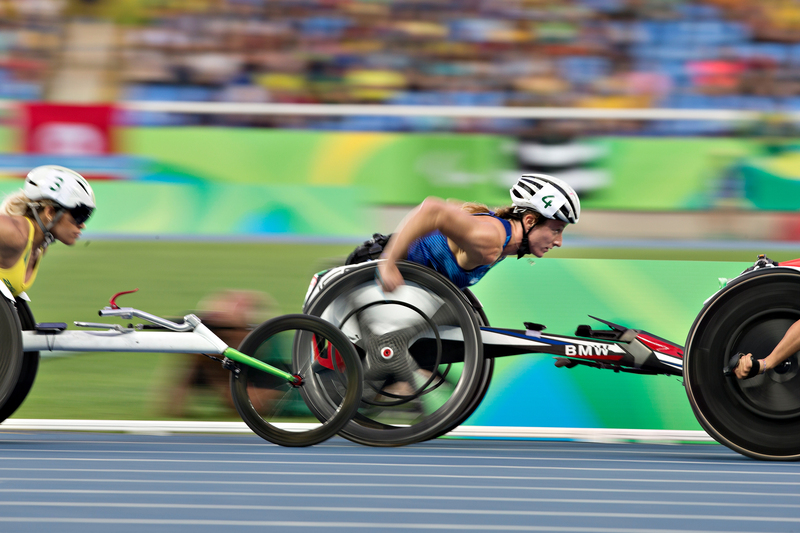 Like some U.S. Olympic champions — but unlike most Paralympians — McFadden’s athletic accomplishments have led to sponsorships from the likes of Nike, BP, BMW USA and Coca-Cola. That type of publicity is a major part of why she’s at the forefront of the Paralympic movement. During the Rio Games, her picture was plastered on BP gas pumps and on cans of Coca-Cola. She also was featured in Sports Illustrated’s Rio 2016 preview. It’s a role that McFadden has gladly accepted. She partnered with BP back in 2011 when the oil company signed a sponsorship with the U.S. Olympic and Paralympic teams. George Bauernfeind, BP’s head of U.S. Olympic and Paralympic programs, was on the team that brought her on as an ambassador. Her desire to push the games into the spotlight didn’t go unnoticed by the International Paralympic Committee. In Rio, the IPC awarded her the Whang Youn Dai Achievement Award, given to the male and female athletes who best exemplify the spirit of the Paralympic Games and the Paralympic values. McFadden’s dominance has already led to an increase in coverage of the games, specifically her events. After each of her races in Rio, there was a cluster of reporters surrounding her while her fellow competitors came off the track without anyone so much as glancing at them. McFadden, of course, isn’t the first famous Paralympic champion. Oscar Pistorius gained worldwide attention four years ago when he competed at the London Olympics alongside able-bodied runners. But any momentum he carried with him came to an abrupt halt when he was accused and then convicted of murdering his girlfriend in South Africa. Other, happier stories have emerged from the Paralympics, such as the partnership between blind sprinter and world champion David Brown and his guide, Jerome Avery. But no others have McFadden’s star power. McFadden’s goals are simple: “We want more media and more TV hours and equal pay.” The U.S. Olympic Committee pays Olympic athletes $25,000 when they win a gold medal; Paralympic athletes get $5,000. BP, however, has taken a different approach — signing more Paralympians than Olympians this year. The types of sponsorships that McFadden now enjoys were virtually nonexistent when she started competing 12 years ago. Back then, she had deals with Hilton and Eagle Sportschairs, the latter of which supplied her with her racing chair and equipment. “When I was in Athens and I was 15 years old, sponsorships just weren’t there for Paralympic athletes,” McFadden said. “I was on a McDonald’s cup, which was great because I was visible. But I didn’t get paid for anything, they just put my picture on there. Competing on a world stage probably has not been the greatest challenge McFadden has known in her life. Born in Russia with spina bifida, McFadden is paralyzed from the waist down. Her birth mother abandoned her in an orphanage, where she spent her first six years. In that time, her only way of getting around was walking on her hands because the orphanage couldn’t afford medical care or a wheelchair. She wasn’t expected to live long, but that all changed in 1994 when she was adopted by Deborah McFadden, who was in Russia on a business trip as the commissioner of disabilities for the U.S. Department of Health. Deborah brought McFadden back to the United States and raised her with her longtime partner, Bridget O’Shaughnessey, in Maryland. In order to help McFadden build up her strength and get healthy, they signed her up for the Bennett Blazers para-sports club. There, McFadden tried her hand at everything, including ice sled hockey, table tennis, swimming and basketball, which she played with the guys. 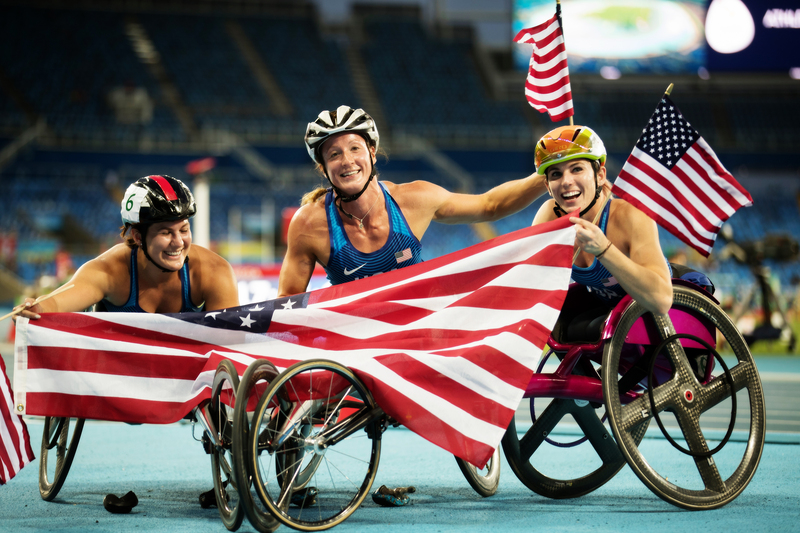 McFadden fell in love with and excelled at wheelchair racing — those years spent walking on her hands had translated into powerful arms, a necessity for the sport. In 2004, at the age of 15, she went to the Paralympic trials on a whim after she managed a qualifying time at the last second. She and Deborah flew out to Sacramento – “all the adults thought it was so ‘cute’ that I had brought her to trials,” Deborah said – but McFadden quickly silenced any doubters and qualified for four events, becoming the youngest member of Team USA at those games. After previously only ever competing in junior competitions, Athens was the first time McFadden raced in an elite event. Nevertheless, she went out and beat veterans of the sport, capturing a silver in the 100 meters and a bronze in the 200 meters. McFadden competed again in Beijing and London, amassing eight medals between the two games, including three gold. Two years later, she even tried her hand at nordic skiing at the 2014 Sochi Winter Games. Back in her home country, she won silver in the 1-kilometer sprint event. It was after London that McFadden began a historic streak in the marathon, the event at which she has been most successful at in her career. Since coming in ninth place in the 2012 Paralympics, she has completed the marathon grand slam, winning Boston, London, Chicago and New York all in the same calendar year, four years in a row. Before McFadden accomplished the feat in 2013, no one had ever won all four in a single year before, in the wheelchair division or otherwise. At the New York City Marathon in November, she completed the sweep again, winning by almost two minutes over Swiss racer Manuela Schar. When she’s not competing, McFadden is training at Illinois, where she also takes classes. She has two younger sisters, who also were raised by Deborah and Bridget. Hannah, 20, and Ruthi, 17, were both adopted from Albania. Hannah, a 2012 and 2016 Paralympian herself, was born with a bone deformity in her left leg, and is an above-the-knee amputee. Ruthi is the only one of the three who is able-bodied. With her friends and family in tow (there was almost 30 of them), McFadden entered the Rio Paralympics with the chance to win seven gold medals, from the 100 meters all the way up to the marathon. It was an unprecedented attempt for a wheelchair racer, but McFadden was ready for the challenge. “We added a relay, the 4 X 400 — we’ve never had that at a games ever before. And also adding on the 5,000 and the marathon at the end was quite different and quite challenging in itself,” she said. Her quest for seven golds ended quickly, when McFadden took silver in her very first event, the 100 meters. She came in second to Liu Wenjun, a racer from the Chinese team, a nation which dominated the games in nearly every sport. McFadden didn’t let that get her down, though. In fact, winning that silver and celebrating it with her family was one of her favorite moments of the games. Her sponsors weren’t down about it either, with Bauernfeind saying, “we were just elated because she had an amazing games.” She went on to win gold in four of her next five events, making her gold total in Rio more than her total from the three previous games combined. The 4 X 400 meter relay was the lone event in which McFadden didn’t medal. It was a historic race, with McFadden racing alongside Hannah, making it the first time sisters would compete on the same team. But a lane violation on the first leg got the relay disqualified. The events that best showcased Tatyana’s dominance, as well as Team USA’s, were the 1,500 and 5,000. McFadden won gold in both of those events, with her U.S. teammates Amanda McGrory and Chelsea McClammer making it to the podium as well. Dubbed the “McSweep,” it was the first time the U.S. had ever owned the podium in the 1,500 at a Paralympics. McFadden finished up the games outside the Olympic Stadium, on the streets lining the scenic and sun-soaked beaches of Copacabana for the marathon. She sprinted out to the front right away, but wasn’t able to build much of a lead throughout the race on the flat course (McFadden prefers hills, which play to her tremendous arm strength). "...it just makes me hungrier for Tokyo..."
She ultimately came in second to China’s Zou Lihong after both crossed the finish line with identical times of 1 hour, 38 minutes, 44 seconds, a new Paralympic record. However, after looking at the photo finish, it was determined that Zou had beaten McFadden by a hair. McFadden’s six medals in Rio tied her with swimmer Jessica Long for most medals won by a U.S. athlete at the Paralympics. The haul brought McFadden’s career total to 17 Paralympic medals. Once McFadden returned home, she and Hannah threw out the first pitch at an Orioles game. She had Mychal Givens catching for her, and he signed her custom No. 16 jersey, which now hangs on the back of a chair in her basement. From there, McFadden visited the White House with the rest of Team USA before flying out to Los Angeles to be on “The Ellen DeGeneres Show,” where the talk show host gifted her with tricked out wheel covers for her wheelchair. She was the grand marshal for Illinois’ homecoming parade at the end of October, and then took on the same role at this year’s Macy’s Thanksgiving Day Parade. Now that the season is over, though, McFadden’s mostly back in Champaign, where she continues to train — though she recently took time off briefly to address the ESPNW Women’s Sport Summit in California, where she spoke about the values of vision, action and impact and how they fit into her life. “You work so hard over the years and you want to think ‘Is there a purpose for me working really hard?’” McFadden said. “I think it’s important because everyone has a story and I feel like I’m relatable to a lot of people in a lot of different areas. McFadden hasn’t decided yet if she’ll be competing at the 2018 Winter Games — “I’ve got to get through this marathon season and relax a bit and enjoy life” — but there’s no doubt she’ll continue to champion the Paralympic movement going forward. “The Paralympics and Olympics are the same thing and so we are trying to teach that to society. We are just normal people who are doing what we love to do and trying to conquer our dreams just like anybody else,” McFadden said. “So I’m hoping that barrier will break a little bit as the sport continues to grow and to prosper.